I’m super duper excited for today’s recipe. And you know it’s legit when I toss a “duper” in there. Why? First, because it’s a breakfast recipe, and you guys know how much I love my breakfasts. Second, because I’m partnering up with the wonderful people over at Egg Farmers of Canada for the month of November, which means I can indulge my inner nutrition geek and talk to you guys about the goodness of eggs. Third because… well… just look at this deliciousness! So here’s the part where I tell you that “this deliciousness” is a banana oat bread pudding that’s a family-friendly adaptation of my much-loved banana oat breakfast bake with some eggs tossed in for extra protein, vitamins (A, D, E), and minerals (iron, folate). 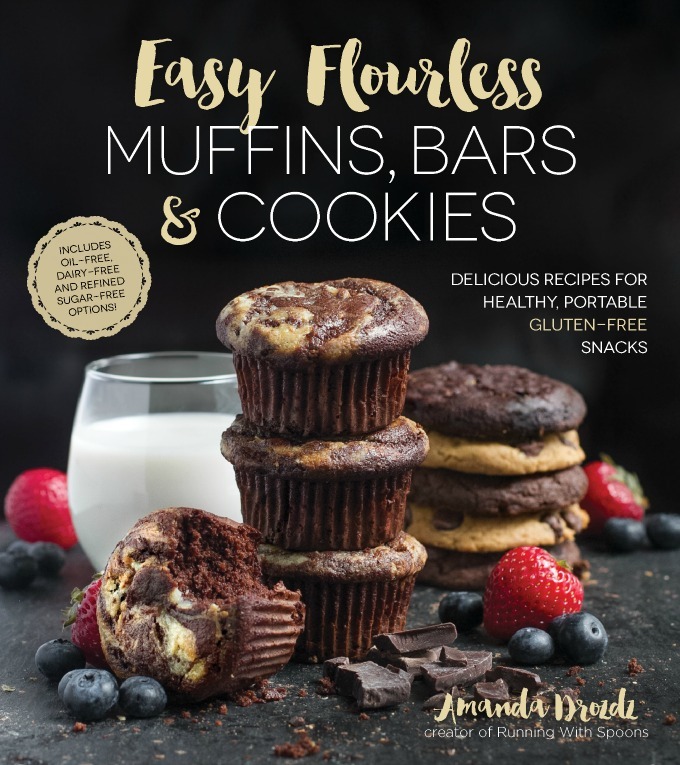 A lot of my breakfast recipes tend to be single-serve since I’m normally only cooking for myself and don’t like the idea of having lots of leftovers lying around, but I know that many of my readers have families to take care of, and that having healthy and portable breakfasts for their little ones is kind of a big deal. Well, this just so happens to be a healthy and portable breakfast that’s perfect for those little ones. Or anyone, really. 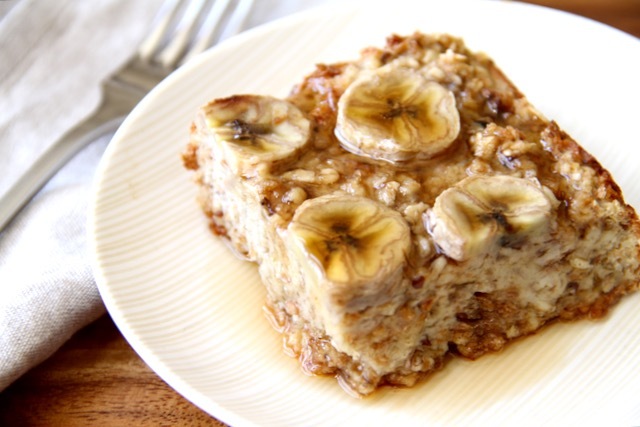 Free of refined sugars and made with the wholesome goodness of whole grains, bananas, and eggs, this banana oat bread pudding is not only easy and convenient, but makes for a balanced breakfast that packs a nice protein punch alongside a good dose of fibre to keep you satisfied all morning. Bread pudding is apparently a pretty popular dessert in different parts of the world, but we’re healthifying it and calling it breakfast here on Spoons because who doesn’t like eating dessert for breakfast? 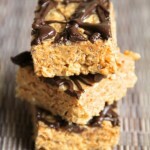 Especially when it’s packed with good-for-you ingredients without tasting overly healthy at all. Preheat oven to 350F and prepare an 8x8 baking pan by generously greasing it with oil or cooking spray. Set aside. In a medium-sized mixing bowl, whisk together milk, eggs, bananas, maple syrup, vanilla, and cinnamon until fully combined. Add bread cubes and oats, and let stand for 10 minutes, occasionally pressing down on the cubes to ensure they soak up the liquid. Transfer to prepared baking pan and top with banana slices, coconut sugar, and cinnamon. Bake for 45 minutes, or until bananas are golden brown and eggs have set. * If you need this to be gluten-free, simply use gluten-free bread. What’s your go to grab-n-go breakfast? « . link love 11/1 . 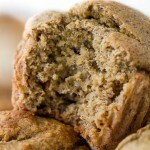 This is perfect timing for my pile of overripe bananas which I mentioned in my post today! 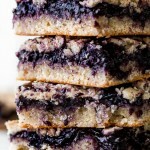 I bet this recipe would be great with cinnamon raisin Ezekiel bread. I’m betting you’re right! And I wasn’t kidding about being totally willing to take those bananas off your hands — I’m having the hardest time finding bananas that aren’t mutant green! All ingredients that I can get behind! If this bread is even half as good as it looks, I’m there! I always like to have muffins on hand for grab and go! Or eggs baked into muffin cups, but I am much more of a sweet breakfast person. Me too! My day just feels strange if it doesn’t start out on a sweet note. You definitely don’t have to sell me on eggs 🙂 This looks SO delicious right now I can’t take it! 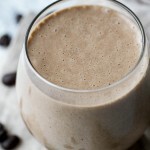 Love the look of this, especially when you’re a little tired of plain baked oatmeal (not that it isn’t delicious) and want to feel like pudding for breakfast, plus good to make ahead! 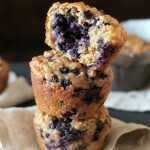 As a self-proclaimed texture freak, it’s definitely nice to put a spin on traditional baked oats every now and then. Can you believe Ive never had bread pudding? I know – such a shame. 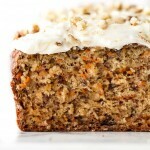 I may have to find a good gluten free bread and make this though – because it seriously looks to DIE for! 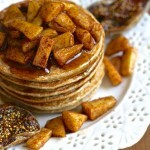 Although bananas are probably the top of the list for my favorite breakfast add ins. I just love that flavor so much! Udi’s makes some pretty great GF bread! I’ve actually made an apple bread pudding using their products in the past and it came out really great. 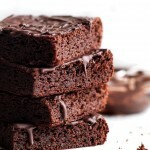 Amanda – your photos are making me wish I could teleport to your kitchen! Usually bread pudding is incredibly filling to me – but I could go for seconds of this refined sugar free one with oats and ‘nanners! Deeelightful! And my grab and go breakfast usually is a yogurt or Protein bar. Haha, I remember feeling SO gypped as a kid when my mom would pull out bread pudding (with raisins??? Not even with chocolate?? ?) for dessert. Breakfast is more like it!! I had a concoction I made that was like chocolate banana protein batter? It was good. ?. 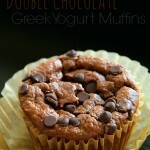 I don’t really have a grab-and-go breakfast, but the closest thing is probably chocolate strawberry protein soft serve. It doesn’t take long to make, and I can whip it together and eat it quickly. Mmm oh man I do love some bread pudding. I also love eggs and eat them most mornings. It’s funny because I went through a phase for several years where I couldn’t stand eggs and now I eat them all the time. Weird how our taste buds change like that! Btw, I wish I could come watch you in action because your photos are always so beautiful! I’m thinking of getting a macro lens in the near future and I’d love to know if you have any recommendations! I’ve never actually eaten bread pudding! I see it all the time on the food channel though. I love the simplicity of this recipe… and I am a 100% egg lover. Oh, yum! I don’t like traditional bread pudding, but this looks tasty. I could definitely go for a slice or two for dinner! I usually make single serve breakfasts too – mostly because I think I’d get sick of eating the same breakfast 4 or more mornings in a row! And John is more of an egg person in the mornings so he wouldn’t be of help with eating up the leftovers lol. But every so often it’s nice to have a batch breakfast that I can just quickly grab in the mornings. This one looks absolutely divine! 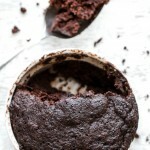 I had oatless zoatmeal (rice and buckwheat flakes, chia seeds and shredded zucchini) in a mason jar…so some grab and go action that I ate in class! did you know that bread pudding is MY FAV?!?!! Like really. and man oh man do i love it! seriously, can you just move here, please? I’ll make coffee, you make this. mmm k? 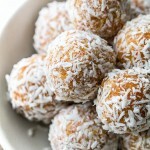 Throw some Healthy Bites in and you have yourself a deal! THAT SYRUP…I can’t wait to try this. breakfast this morning: part of a chicken breast, a banana with peanut butter, and a handful of Kashi Cinnamon Harvest. Weird? Yup. That looks really good! I didn’t have breakfast and didn’t have lunch so let’s just say I was super hungry by dinner and had a nice salad but then had a bunch of candy….ugh. Bad way to start the day. It always happens when I visit my parents. I love you partnered up with eggs because they make me happy and they’re a food I adore with so many healthy benefits, especially when you use the entire thing. Plus bananas…swoon and super duper is right. I’ve never had bread pudding but this looks so pretty! This is everything I want right now and more. 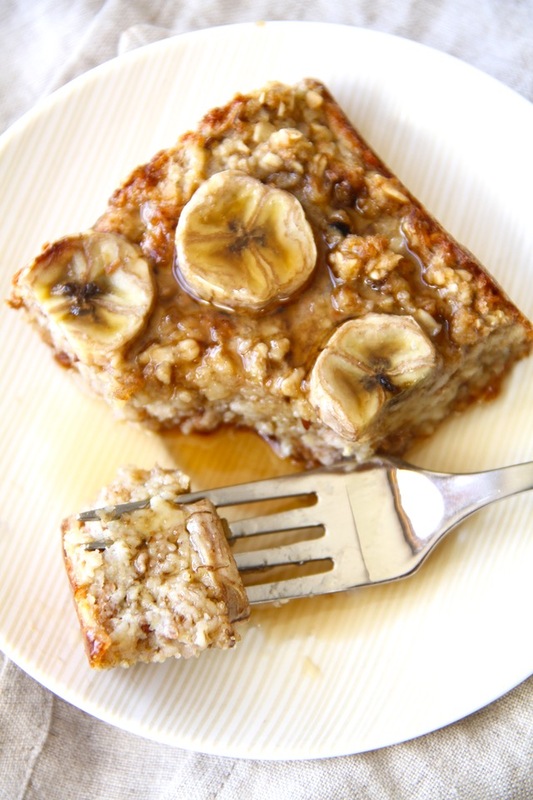 The fact that I could eat bread pudding on the go (with bananas in it!) is amazing. While I don’t eat eggs the look of this is wonderful nonetheless. 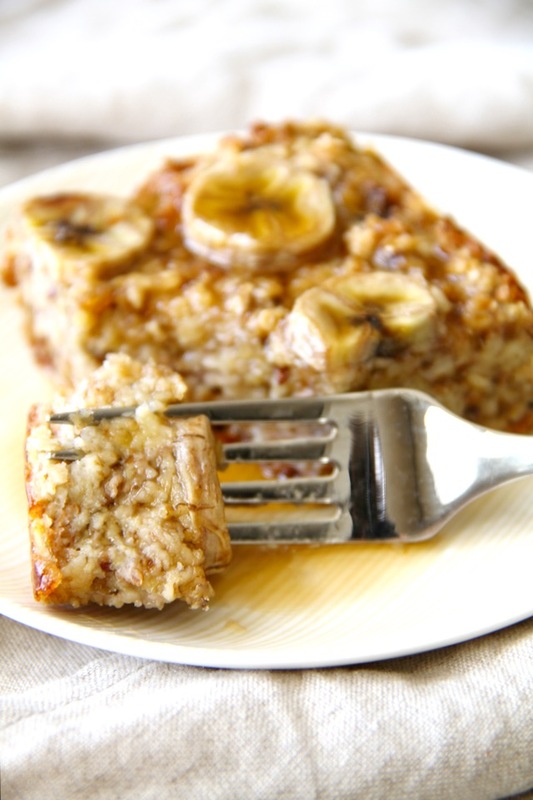 That sirup on top of warm banana-fied oat bake … mmmh. I’m not a big fan of breakfast – I know! Mostly because especially these days I just don’t know what I want. I usually go for oatmeal because it’s filling and warm – much needed on these cold and gray days. Not a fan of… breakfast? 😯 My mind just can’t process that statement. Just please tell me you do breakfast for dinner. Or lunch. Um YUM. I am ALL about banana anything. This looks awesome! I would love to make this for my family when I am home for the holidays. Pinning for sho. Can this be my breakfast every day for the rest of time?! K THANKS BYE. Okay when you first told me about this, I pictured like….those pudding cups lol. This is much better! Quick question – about how many slices of bread do you use? Not used to measuring by the cup.. It really depends on what kind of bread you’re using, but it should be about 4-5 slices. I made this for my kids today. 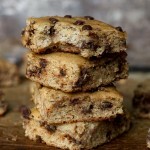 I loved that it was a healthier take on traditional bread pudding. It turned out great! Thanks! Hi! Can I assemble this the night ahead? Thanks!